Bullroarers are traditionally used by Australian Aboriginese in sacred rituals to balance spiritual energy and to ward off evil spirits. 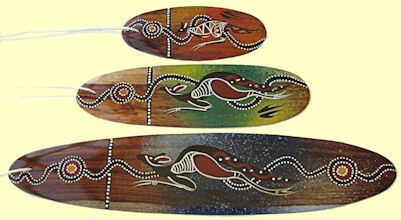 12inch (30cm) hand crafted and hand burnt bullroarer is made of Australian Mulga wood. 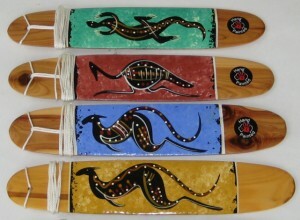 The bullroarer has decorations on both sides. 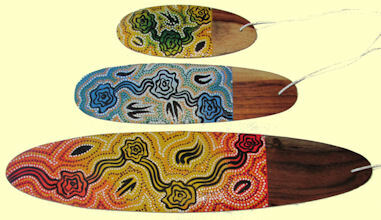 Elegant light bullroarer hand crafted and hand painted by Aboriginal families in Queensland. Easy to handle. Great for outdoor fun with kids. The back side of bullroarer is blank, so you can use it as a post card / place card, or we can print your corporate logo on it.